Tainai Pilsner is 5% German pilsner from Tainai Kogen Beer, based in Niigata, Japan. It’s part of their all-year round range of beer and can be found in both bottles and on tap. Like the rest of the Tainai Kogen range, Tainai Pilsner follows the German Reinheitsgebot, aka German Beer Purity Law, as a guideline. 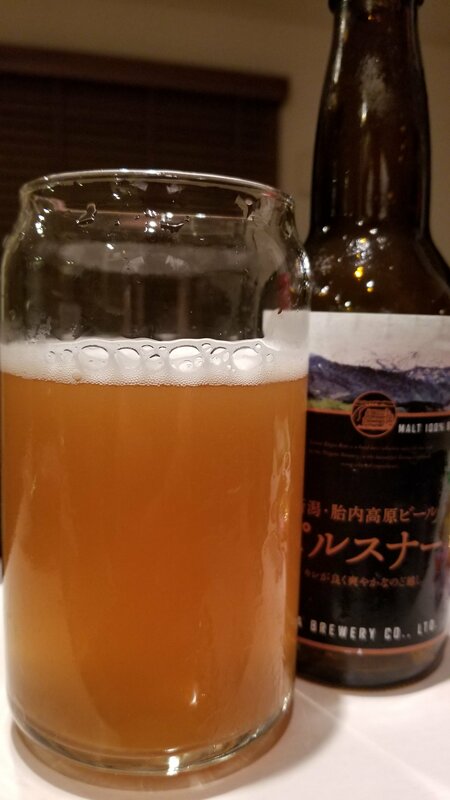 Tainai Pilsner poured out a hazy orange yellow colour with a bare minimum of fluffy white head on top. The aroma though was more on the off-side than a pleasant crisp pilsner – a subtle sour butter nose permeated through the biscuit malts. That off aroma pervaded through when chilled and even more so when Tainai Pilsner had warmed up to room temperature. If there were any hop aromas in Tainai Pilsner, then they were overwhelmed by the buttery nose. The body was unfortunately more of the same as the nose – a strange buttery flavour that could not be avoided. The beer was well in-date – it had an “expiry” date of February 2019, so this was either a dodgy batch or probably just off. The biscuity malt flavour did bring some kind of respite from the off-flavours for a brief moment, but not enough to save Tainai Pilsner or make it worth buying or drinking. Avoid Tainai Pilsner – unless it was just a one-off bad batch, but I doubt I will risk buying another one.